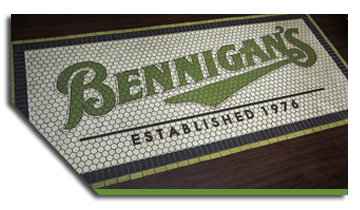 Mandan, ND (RestaurantNews.com) Bennigan’s is known for the emotional connection people worldwide have to the iconic, 42-year-old brand, and that bond will be reinforced yet again when its newest restaurant opens in Mandan, N.D., on Aug. 20. Bennigan’s Co-Owner Gwen Mangiamele and local entrepreneurs Monte Stein and Rob Knoll have been friends since childhood. Monte and Rob recently approached Gwen with their goal to bring Bennigan’s – a national casual-dining brand they’ve loved for years – to Mandan, a town of roughly 22,000 people. The new restaurant, located at 1506 27th St. NW, will celebrate its grand opening with a ribbon-cutting ceremony beginning at 11 a.m. on Monday, Aug. 20. Mandan Mayor Tim Helbling, who attended high school with Stein, Knoll and Mangiamele, will join the festivities in welcoming the town’s first casual-dining restaurant. The new Mandan Bennigan’s will offer more than a dozen ice cold beers on tap, a wide assortment of handcrafted specialty drinks, multiple HD TVs and plenty of banquet space. The chef-driven menu features signature, made-from-scratch Bennigan’s favorites like the World Famous Monte Cristo, Oh, Baby™ Back Ribs, the Turkey O’Toole, Lina’s Crispy Chicken Sandwich, true half-pound Prime Burgers and the decadent Death by Chocolate™. In addition, three authentic Steak & Ale Classics – the Original Kensington Club, Hawaiian Chicken and Smothered Chicken – will be showcased. The restaurant will also feature a booth dedicated to Mangiamele’s parents and long-time Mandan residents, Lillian and Leonard Bachmeier. Since the end of 2012, the company has opened new franchise locations in Clarksburg and Frederick, Md. ; Sacramento, Calif.; Melbourne, Fla.; Monahans, Texas; Lexington, Ky.; Veracruz, Mexico; Larnaca, Cyprus; Obarrio, Panama; Doha, Qatar; and Dubai, UAE. New restaurants are coming soon to Steubenville, Ohio, and Memphis, Tenn.; and internationally in Guatemala, Honduras, El Salvador, Amsterdam and Pakistan, with more than 100 additional locations in development. Mandan’s first Bennigan’s will be open Sunday through Thursday from 11 a.m. to 11 p.m., and Friday and Saturday from 11 a.m. to 12 a.m. For more information, visit Bennigans.com.